A person with this badge can design, customize, navigate, and manage large sets of data and databases. They can create tables, queries, forms, and reports. This person can exchange data between Access and other applications. By creating macros this person can save time by automating complex and repetitive tasks. This person can analyze data using advanced techniques. 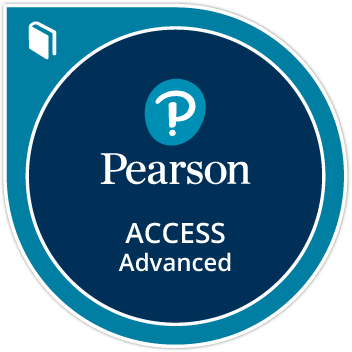 Learner has demonstrated proficiency of Advanced Access learning objectives by achieving a 90% or higher score on a MyLab IT Grader "Live-in-the-Application" Access Project.